In a competitive global economy, decision-makers don’t have the luxury of throwing resources at an IT infrastructure that is incapable of responding dynamically to business needs. Many organisations have significant investment in legacy infrastructure and this, combined with the rapid proliferation of applications, is creating an IT conundrum – how to free up time for digital innovation while managing complex traditional architectures. HPE SimpliVity is meeting this challenge head-on by offering a hyperconverged solution that enables organisations to streamline IT operations at a fraction of the cost of traditional and public cloud systems. By combining IT infrastructure and advanced data services into a single, integrated all-flash solution, organisations can rethink their IT strategy. Neil Simonsen, regional sales manager at HPE SimpliVity, says IT departments can no longer afford to be a slave to the 80:20 rule where 80% of time is dedicated to keeping operations running, leaving only 20% to focus on innovation. “The world has changed dramatically in the last 10 years with smartphones and always-on connectivity. Companies that can embrace this change make huge strides. If you look at how Uber changed the taxi industry without a footprint and not owning one car, you realise we are in unchartered territory,” he says. HPE SimpliVity enables a digital strategy with its hyperconverged platform that helps IT directors simplify the demands of their hybrid environment with a software-defined architecture. “If you can make digital innovation work for you, it is possible to transform your industry or the way you work with customers. HPE SimpliVity introduces simplicity to an organisation in multiple ways – it is the most efficient platform to run a modern datacentre in terms of footprint and rackspace; power and cooling; data storage; integrated backup; performance and management. Customers love it,” says Simonsen. Prior to adopting HPE SimpliVity, customers have found provisioning a virtual machine (VM) is a complex process demanding changes to underlying storage, backup policies, replication and disaster recovery. “With a traditional architecture, it was time consuming, touching multiple interfaces and management portals. For a large organisation with separate compute, storage and backup teams it could take 48 hours to provision a VM. With HPE SimpliVity compute, storage and backup are in a single appliance and provisioning a VM can be achieved through a single interface in minutes,” says Simonsen. He gives the example of how one manufacturer with a VM corruption would have lost a full day of production, but with HPE SimpliVity was able to restore the VM in under a minute avoiding any costly downtime. With common APIs and a software-defined architecture enabling automation, IT teams are free to focus on innovations such as application deployment, and can skill upwards to positively impact the organisation’s bottom line. SimpliVity backup operations have no overheads, generating no I/O data transfer, thereby removing strain on the underlying storage system and eliminating the necessity for a change window as operations and performance are not impacted. “Data protection is in ‘onion layers’ with multiple points of protection from the hard drive level up to protecting between multiple sites with very efficient replication,” says Simonsen. If your organisation wants to reduce the complexity and cost of its legacy infrastructure; improve performance, agility and scalability; while increasing efficiency around data services to gain time for IT evolution, then HPE SimpliVity is the right solution. 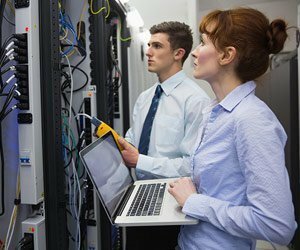 IT departments can offer a more efficient service to the business thereby reducing cost of ownership. Hardware and processes are consolidated into a simplified solution reducing the cost of the datacentre footprint and allowing the business to recover data in minutes rather than hours.